With three excellent concerts — a stunning combination of electronic music and dazzling visuals, a biographical portrait of a great painter and a revival of a classic 1960s rock album — this OzAsia Festival covered the widest range of musical and artistic territory. Renowned for reviving great hits, Regurgitator is a rock trio with two regular guests, German-Australian singer and keyboard/synth player Seja, and guzheng player Mindy Meng Wang. 2017 marks the 50th anniversary of the seminal 1967 album The Velvet Underground and Nico and this extended Regurgitator line-up has performed this album many times in different contexts, for example at MOFO this year. In the musical arrangement they have developed, drummer Peter Kostic uses a kit typical of Velvet Underground drummer Moe Tucker’s set-up, emphasising tom-toms and bass drum, frequently using mallets and making little use of cymbals. The significant change to the original arrangement is the introduction of the guzheng, which adds a sonic and cultural dimension to what by 1967 standards was already an experimental sound. The guzheng’s delightful tone lifts the music out of the New York underground and renders it more universal. Presumably the addition of the guzheng provides the Asian link that prompts the inclusion of this production in the OzAsia Festival. In her contributions to this festival, Mindy Meng Wang demonstrated great versatility, and for her work with Regurgitator she creates a unique vocabulary of sound, adding swirls and gestures to the rock arrangement, playing the equivalent of a guitar solo on one track, and contributing an ethereal headiness that gently transforms the music. The essential strength and character of the original album lies in Lou Reed’s intense and insightful songs such as “I’m waiting for the man,” and many tracks are now considered all-time rock classics, variously musing on drug addiction, sadomasochism, sexual promiscuity and other aspects of 1960s New York life — themes still relevant today. Regurgitator give a fine performance, Seja engagingly delivers Nico’s three songs, and the final track, “European Son,” in the original version of which the musicians really let their hair down, is an invitation to Regurgitator and friends to do likewise. The audience is delighted. 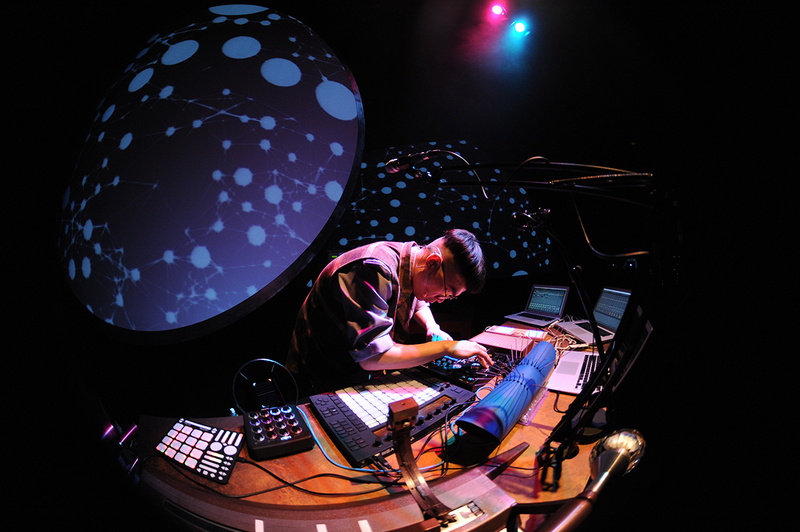 Energetic Hong Kong composer, performer, instrument inventor and visual artist GayBird (Keith Leung Kei-cheuk) produced one of the most optically involving concerts I can recall, as much a visual art experience as a musical one. Working with a team of video, illustration and lighting artists, he uses lasers and a huge LED screen covering the rear of the stage to create a mesmerising cascade of fantasy-inducing visual imagery. For the concert’s second half, Zephyr Quartet members were positioned on stage in front of the LED screen while GayBird on the auditorium floor worked at a table of synthesisers, a shallow box with springs stretched over it that he bowed or plucked, and an old manually operated siren. In contrast with the advanced technologies he used in the first half of the concert, some of the devices deployed in the second, never intended as musical instruments, reminded us that interesting sounds may be made from simple means. GayBird said in a RealTime interview that he chose the concert’s title, Music in Anti-Clockwise, to indicate that he was starting the concert with the future of music and working backwards to early forms, here Haydn’s first string quartet. The version presented here is dramatically reworked and blended with other sounds, perhaps suggesting that our idea of the past is imaginary. 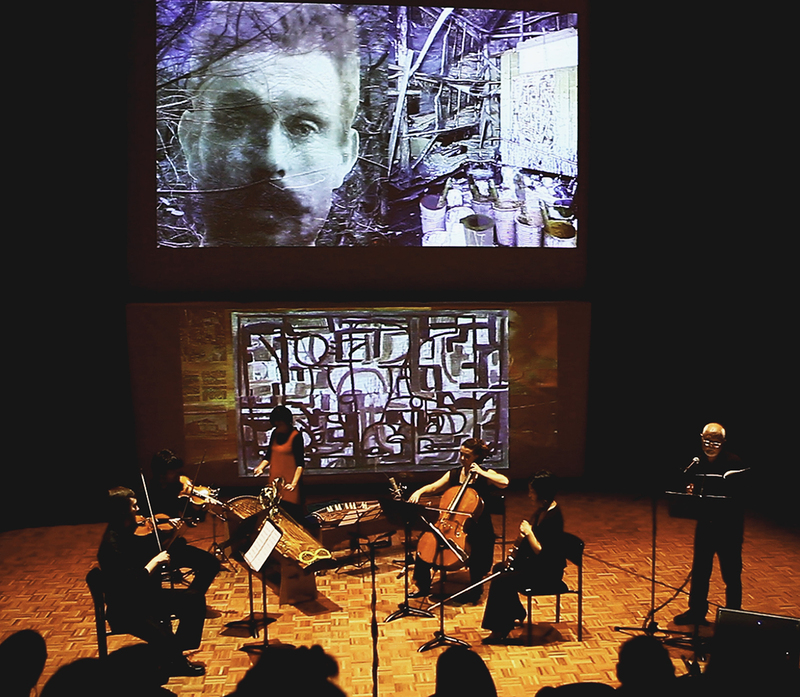 The dazzling mix of sound and imagery in this magical concert continued, with added images such as ticking clocks, floating musical notation and keyboards. GayBird’s performance was preceded by a fine set by Adelaide singer, songwriter and multi-instrumentalist Tracy Chen. Her unobtrusive but sophisticated use of digital technologies to sample and loop her own soft voice and her instruments made for a seductively layered sound. She refers to her creations as ‘bedroom music’ — it can be made at home and has an introspective, melancholic feel, but its complexity and coherence suggest a clear musical vision, perhaps reflecting the direction of future music production. Her gentle sound proved a well-chosen curtain-raiser to Music in Anticlockwise. Legendary Scottish-born painter Ian Fairweather (1891-1974), who spent the latter part of his life in Australia, is revered today as one of our pioneering abstractionists. Dramatically evoking Fairweather’s life, this production combines visual art, music and spoken text, and was developed collaboratively by video artist Glen Henderson, composer Erik Griswold and writer Rodney Hall. Hall’s narration eloquently captures the central characteristics of Fairweather’s history. The artist spent many years travelling through Asia, particularly China and Indonesia, studied drawing and Japanese language during and after his time as a prisoner in World War I and, later, Chinese visual art and language, also spending some time living in a temple. “China was the nearest place he ever came to home,” says Hall. These experiences deeply affected his thinking and his art. Hall notes that calligraphy, which is central to Fairweather’s art, is “a journey manifested by the hand alone.” In his last years, living on Queensland’s Bribie Island, Fairweather became a scholar-hermit, perhaps in the manner of Chinese antecedents. Such a life story seems surreal: “This is not a life you choose, nor did I,” he had said. The performance of this 2013 creation is compelling, the images and music subtly underscoring Hall’s text. Griswold’s music is scored for koto, bass koto and string quartet, the opening passages have a Chinese flavour and dramatic passages relating to the war years suggest the psychological disturbance of war. Performers Satsuki Odamura and Adelaide’s much-in-demand Zephyr Quartet are outstanding. At one point, Odamura brushes the bass koto with a small eucalyptus branch, making a soft sound like wind in the island’s trees that is symbolic as much as musical, and she uses the bass koto to suggest swelling ocean waves to accompany the description of Fairweather’s raft journey across the Timor Sea. Griswold’s score for The Raft part 1 (“Epiphany”) is marked ‘hypnotic’ and the music takes us into that dreamy state. Glen Henderson’s video sets the tone, using layers of imagery in the manner of Fairweather’s paintings. One scene shows an image of the sea through mangroves, the swirling lines of the branches resembling Fairweather’s sinuous drawing. A photographic portrait of the artist can be seen faintly hovering through the branches over the sea like a spirit and it returns regularly to haunt the story. Following the performance, there is a Q and A session in which Art Gallery of SA curator Tracy Lock introduces the three collaborators and provides important insights into Ian Fairweather’s artwork. Evidently, one painting was found to comprise 70 layers of paint, the layering of imagery becoming a metaphor for the aggregation of life experience. Griswold says that the rhythmic flow of Fairweather’s paintings suggests the flow of music — it inspired his composition and was the genesis of the production. He describes this production as, “a poetic homage to Fairweather… We are trying to create a very immersive experience that will hopefully take you into that psychological mindscape.” Hall, Henderson and Griswold’s Fairweather succeeds wonderfully in this endeavour and is a magnificent portrayal of an artist’s life.